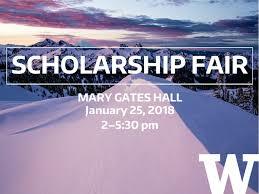 Plan to attend the Scholarship Fair next Thursday, January 25th from 2:00-5:30pm in Mary Gates Hall! Over 25 programs will be tabling and students will hear from seven different scholarships during information sessions throughout the day. Learn about over 25 different scholarship and fellowship programs. Drop by any time during the fair! Learn about the Leadership 1000 scholarship, an award of $1,000-$5,000 per academic year for Washington state residents enrolled in a Washington state college. The Schwarzman Scholars is a selective, global fellowship that funds an 11-month Master’s degree in Global Affairs at Tsinghua University. Do service-work abroad and build relationships with local communities after you graduate! Working on your Foreign Language & Area Studies application for summer study abroad or language study for next year? Come to the session for last minute tips! Calling STEM majors! Learn about Space Grant scholarships for students pursuing degrees in science, technology, engineering & Math! Become one of 40 scholars who will go to the United Kingdom to earn their graduate degree. Learn more about this program & how to apply at this session! Become one of 100 scholars who will receive a full 3 year scholarship for graduate study at Stanford. This entry was posted in Lectures/Panels, Research, Scholarships/Resources, Summer Program. Bookmark the permalink.